I got these “vintage” dresses recently and I don’t know what to do with them. I thought the fabric they were made of was nice and figured I could repurpose them. However, I’m stumped. First, the dresses are very small. Approximately a size 8 or smaller. I have them on a small size dressform and can’t even zip up the back of any of the dresses. I like the colors and fabrics but am lacking inspiration. I don’t know whether to just give them away, sell them, or take them apart and reuse the fabric somehow. I am even trying to think creatively, like perhaps I could use them for home dec items, cushions, curtains, something. I’m looking for your ideas and suggestions. 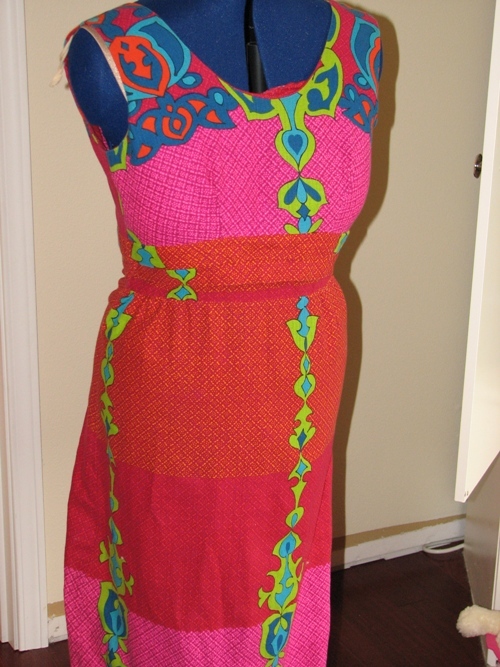 Dress 1: A full-length Hawaiian print sundress. 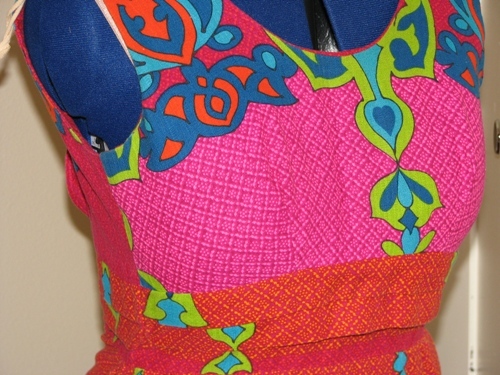 It has a zipper back, facing around armholes and neckline. 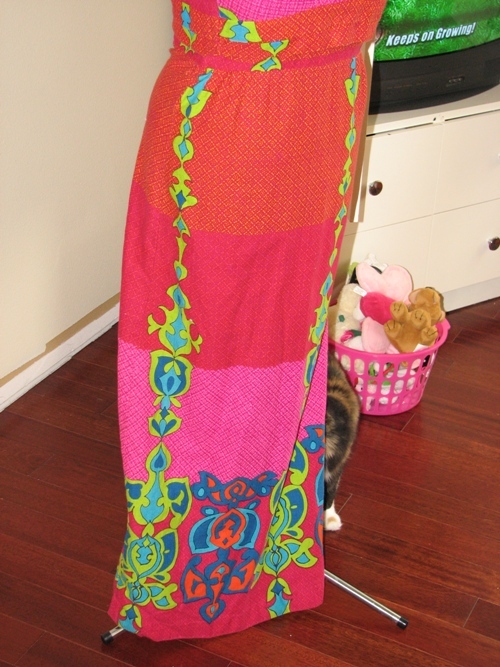 The fabric is quite thick and heavy – I think it’s a cotton with a slight krinkle to it. Not sure it’s “vintage” but it’s bold and bright. Dress 2: Now this is a weird one. 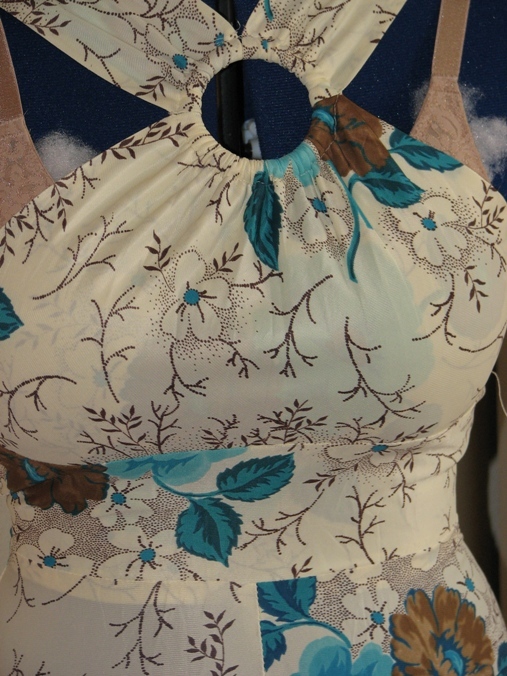 I didn’t realize until putting it on the dressform that the fabric is an acetate nylon mix. It’s the kind of fabric I’d expect in a lingerie item. Odd. But I absolutely love the colors and the print on this. I wonder if I might be able to recycle it into some sort of nightgown and add some lace to it. Alternatively, it might just be a great lining to a chocolate brown jacket. 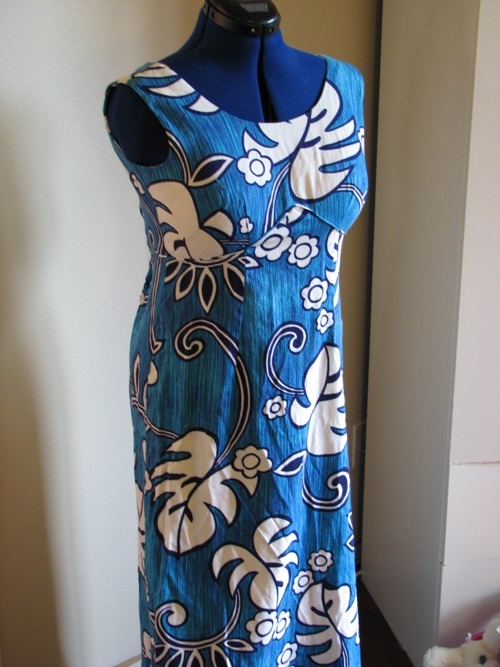 Dress 3: This is another Hawaiian dress, according to the label. This is the only one my daughter liked, by the way, but none of these dresses will ever fit any of the women in my family. The woman who could fit these dresses has to be very petite with zero hips and a small bustline. I like the border print on this and all I can think of to do with it is to repurpose it into something for children’s wear. So what would you do with these? I’m eager to hear your ideas. Hi Camilla – the furry girl is my little Marie, one of my sewing helpers. My sewing creative juices haven’t been flowing in many months, so I won’t be able to help. However, I must say that I’d kill for that Dress #2 with the delightful bodice. Actually, I’d kill for the body that used to be able to wear something like that. I love it. Ha, April! It might fit you – you’re pretty tiny. You’re welcome to swing by and try it on. 🙂 It is a really pretty dress. I just wish I was tiny enough to wear it. i like cami’s idea of bags for dresses 1 & 3. dress two could be a pretty top or something lingerie-ish. how did you end up with these dresses? I got them off a coworker who was selling them as part of, I guess, an estate sale, because his wife surely wasn’t old enough to have owned these herself. I paid $5 each for them. I figured that was fair. I love dress number 2! Cut that one off, add a jacket or shawl and wear it out dancing! By any chance are the first and third dresses by Malia? 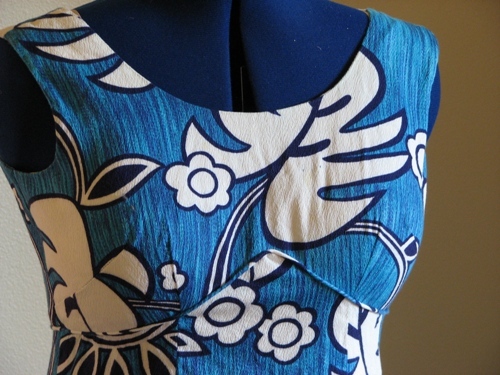 That company produced gorgeous cotton print dresses during the 60s and 70s. The dresses tended to have built-in bras and often were made of a heavy cotton pique. I have such fond memories of the Malia sundresses I wore as a teen in California. I bought one a couple years back on eBay; I knew it was going to be too small but I made it into a slim skirt that I got a lot of compliments on. Meg: I don’t think they are made by Malia, and they don’t have built-in bras either. Sorry. Hi, what a wonderful collection you have there! I think the bag lining idea is fabulous. They would also look fabulous as sleeveless tops, maybe with piping or other (especially vintage) trimmings. Thanks, Nicky. Glad you could visit! I’ll have to hunt down more vintage stuff. I could use a new knitting bag. Sorry, Dress #2 is not for sale. 🙂 But good luck with your wedding, Blkwolves!